Reader beware: extremely picture-heavy post. Also a note on the title, before we get started: the subtitles translate the word "charas" as opium; a friend in Delhi told me it means heroin; and the Oxford Hindi-English dictionary says it's a kind of resin-based preparation of cannabis. I'll just say "drugs" and be done with it. Charas is fantastic. It's glorious, giddy, jam-packed but streamlined 70s masala. I am simultaneously incredibly grateful to have seen it and saddened by the knowledge that for each movie like this I see there is one fewer remaining to discover. Overall, Charas comes off as an action- and comedy-leaning masala with well-implemented touches of James Bond. Moralizing is all but absent; the movie is loosely about drugs, but here drugs are simply an illegal thing that smugglers export to Europe for cash rather than something evil masterminds are going to use to to enslave the innocent of India and bring the moral downfall of a culture. Drugs are a legal issue here, not an ethical one. Family drama, religion, and revenge are succinctly handled with some unusual spin and plenty of impact. There is no melodrama, but I didn't miss it one bit. All the usual masala ingredients are there, but they're in the service of...momentum, I guess I'd call it. It's like everyone involved—both the real people making the film and the characters in it—never forgot that they were trying to outwit each other before the clock ran out. 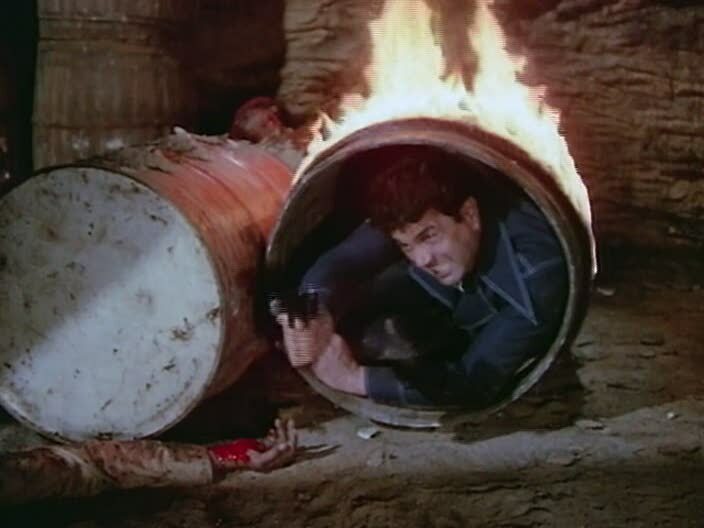 There is little about the plot that you couldn't guess—Ajit leads a group of smugglers in international drug-dealing and has blackmailed Hema Malini into helping him, and Dharmendra, the son of someone Ajit betrayed early in the film, becomes a police officer to stop him—and everyone involved in front of and behind the camera does their job expertly. It's the crew of of Charas who really deserve most of the praise that bubbled out of me while I watched the film. While the cast is very good (with Dharmendra adding that little something extra in some of his comedy and undercover bits), I think it's the crafting and assemblage of all the ingredients that make this film what it is. The other films written by writer/director Ramanand Sagar I've seen, Barsaat and Sangdil, do not at all indicate he'd be so good at creating something as fun as this. 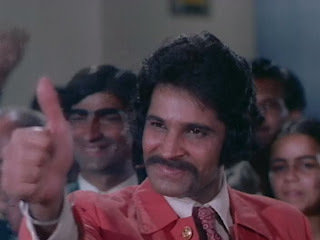 As much as I love the wackadoo and complications of Manmohan Desai, it's surprising to see something as full of goodies as Charas is that somehow remains lean. What follows is a list of what I think made the film so special. This isn't relevant to anything, but I had to include a shot of the best stationery ever. Despite what I just said about the acting being great but not perhaps the greatest thing about this film, it would be a horrible oversight—an act of fraternal treason, even—not to point out immediately that this is Tom Alter's first film. It's a perfectly competent turn in a standard side-good-guy role, but what is notable about it is that he plays an important and helpful character, in stark contrast to what he is now known for (bad guy sidekicks). 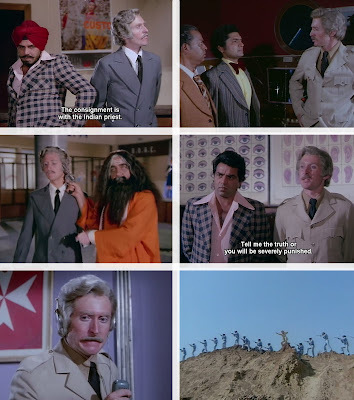 As such, he spends a lot of time with the hero doing brave things: he questions bad guys, shares information, plans with Dharmendra, and leads the police in shootouts and raids. He's the lone person in khaki on the ridge; all the other police are in blue. But mostly I just liked all the diagonals in this shot. It's not the most demanding role imaginable, but it is by far the biggest and most significant one I've seen him in. I could probably even argue that he's a sort of stand-in for the hero's father, providing some emotional support and definitely acting as a protective comrade-in-arms. Nice wig, too. All hail the FTII-trained king of the gora bit players! Charas hosts some pretty spectacular musical numbers. 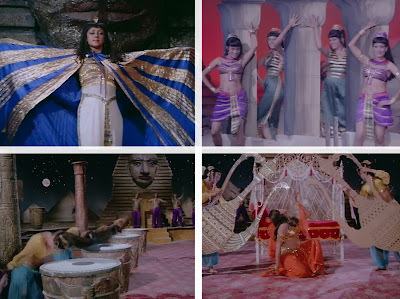 Hema's character is a dancer (the subtitles keep calling her an actress, but we don't see any acting) who tours internationally, and she enters the film from the head of a sphinx in the wonderful Egyptian-themed number "Mera Naam Ballerina." The backing dancers play drums with their hair. Hema's dance troupe is roped into helping smuggle the drugs out of India in their sets, and we get to see those ewers and some other large-scale constructions a few more times. 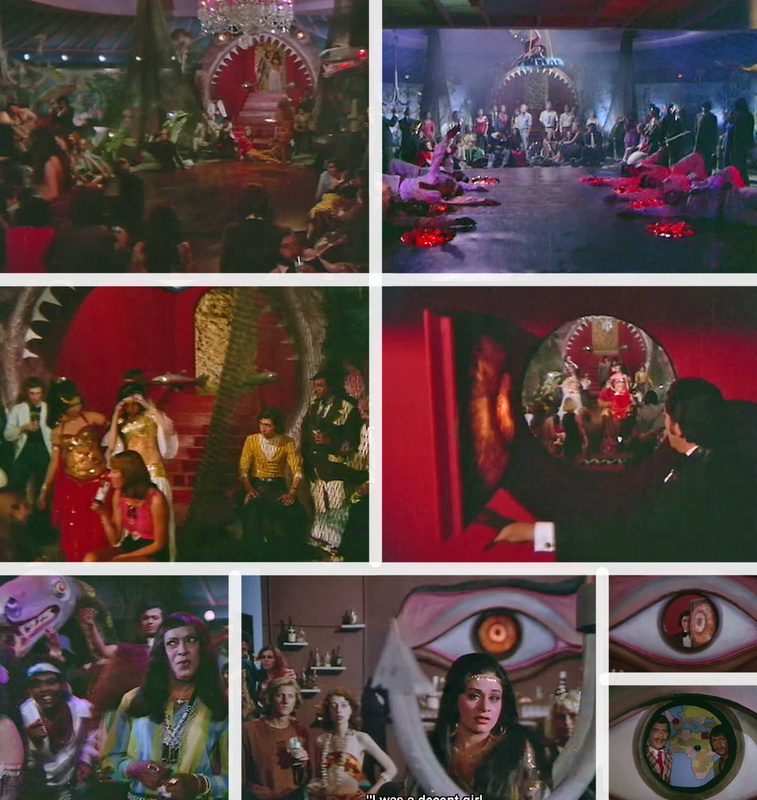 In one of the grand traditions of lavish stage numbers, the visual theme has nothing to do with anything in the rest of the film. And who cares! It's fabulous (and is near the top of my list of Egyptian-based or -themed film songs). 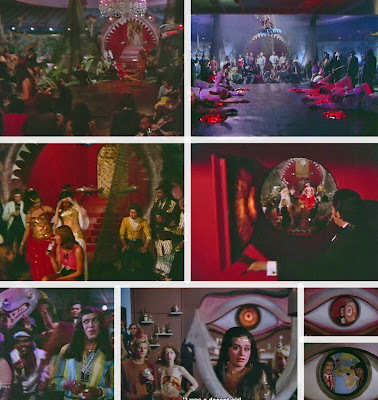 As if in retort to the good girl's big song, the villains have a nightclub in their property in Malta (where much of the action takes place), where we get two songs with Aruna Irani (playing Dharmendra's presumed-dead and kidnapped sister, who has been forced into the shameful life of a dancer [eyeroll]). This is one of the best nightclub sets ever, crammed to the gills (ha!) in all directions with sea creatures and fishing props. And a giant eye that opens into a back room for spying. Of course. Run, don't walk, to those youtube links to see this thing for yourself. The blood-red entrance is a giant shark mouth, complete with two other little fish inside it. There are lava vents, giant anchors, and seahorses and frogs with light-bulb eyes. As is completely sensible, the smugglers and police, spread over two continents, need to keep in contact, and there is a vast array of communications equipment. Both sides have bleeping, blinking control rooms full of knobs and switches (note the Maltese cross in the police room). 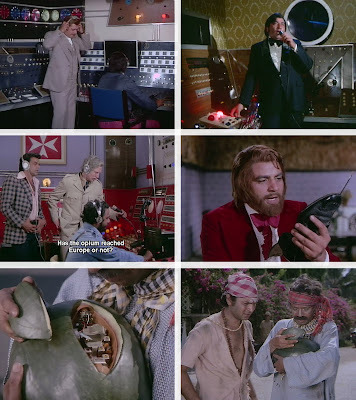 Dharmendra has the classic shoe phone and officers Asrani and Keshto Mukherjee have tracking devices hidden various places, including a watermelon. I'm so pleased to say that this is not the only film I've seen that hides transmitters in melons (it also happens in Inkaar). There's a smattering of religion in Charas, but it's Catholic. 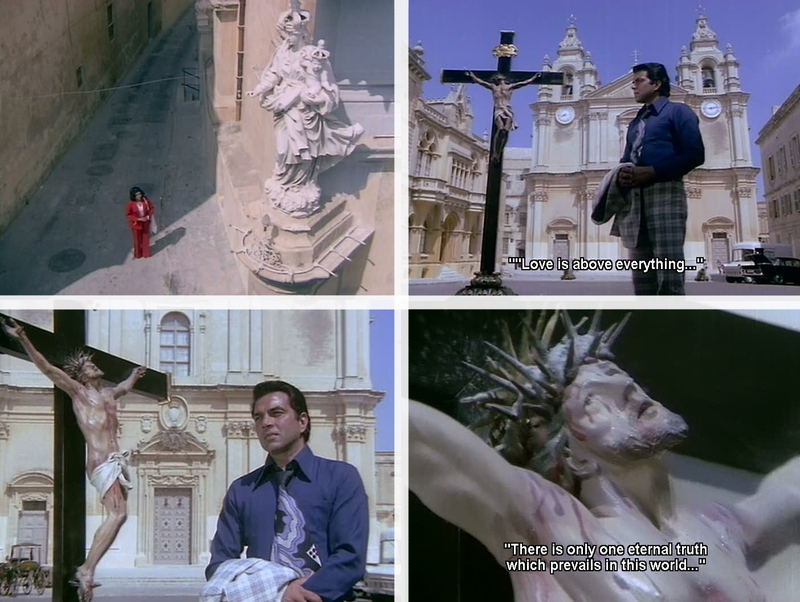 When Hema is distraught over a missing Dharmendra, she wanders through the streets and prays to a statue of Mary for his return. Elsewhere in town, Dharmendra sadly ponders a crucifix (see most of it here). If the subtitles are accurate, this is the kind of exchange I can imagine happening with the more typical shrines and temples. I don't know if it's unique, but the direct address by both characters to Christian figures, when they have not been previously identified as Christian, was both interesting and site-appropriate. I like that the movie acknowledged that it was in a small corner of the central Mediterranean and did not pretend that there would be a Hindu temple conveniently around the corner. Sure, it probably pretended lots of other things that don't exist in Malta, but this one was a nice link between what film characters typically do and what would actually make sense for their setting. It also quietly suggested an attitude about the universality of the divine and the power of prayer that I wasn't expecting. I still can't quite put my finger on what reminded me so much of James Bond in this film. No one is a spy, so I think it must have been the sunny European locales and the emphasis on the crime. Certainly a motorcycle and car chase over winding hilly streets helped, as did the island depot/lair that the smugglers use as the final stop for their crates of drugs (seen in the bottom two images above). I would love to know where this was shot; if it's a set, it was very well done, full of stalactites, flooded floors, and machinery. I also really liked how some of these shots were set up: lots of diagonal lines and plenty of scope to see what's going on from interesting angles. Hema too is forced into this life of crime by Ajit; he says he has evidence that can either convict or acquit her of a long-ago murder. If she doesn't help him with his smuggling, he'll turn her in, and the loss of her income will force her crippled father onto the street to beg and her sister into a brothel. Those words echo through her head and she agrees to his terms. The hero too throws around questions of honor. Seeing all the white and, presumably, charas-addicted kids in a hotel, he asks whether she'll behave similarly. She gives him the "Indian girls don't do that" line, but he doesn't seem to mind and they head off to sing a love song in their hotel rooms. Bowls of fruit almost always lead to knife violence in masala films. and then pleading that she loves another. 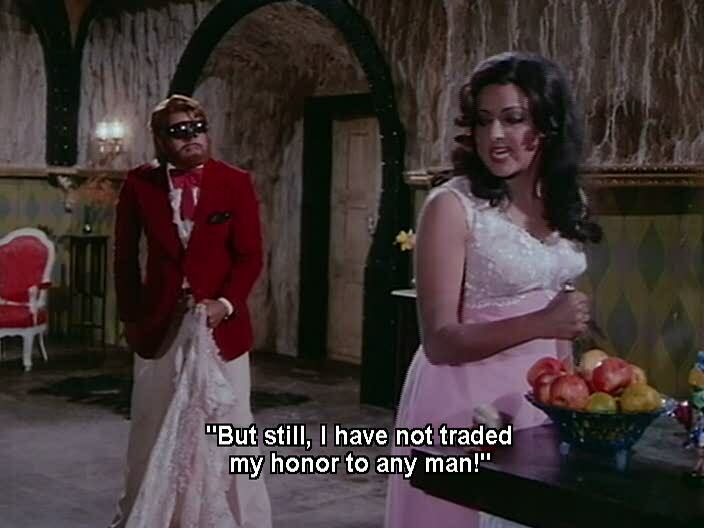 Dharmendra witnesses this whole exchange and is initially furious that she would betray him but then realizes that she has been forced into the situation and is trying as hard as she can to fight off the sheikh. The villain treats women as he does drugs: capital. He talks about photographing girls while his men "molest" them and selling the pictures to Europe, but he does not do the molesting himself or surround himself with dancing girls who feed him grapes. It's another example of a villain who has no interest in the sensual pleasures of the crime he commits—he just wants the money or whatever advancement of his plans they can offer. Even these women's "honor" is a means to an end rather than, to borrow language from other films, a juicy fruit that he wants to savor himself. This is in no way to say that he's not such a bad guy after all. He is, but he is more simply pragmatic and greedy than he is debauched or threatening to moral order or integrity. To end, here are a few other masala delights. The wardrobe crew of Charas was relatively restrained, but that doesn't mean the clothes are boring. No no no. There is a ton of plaid in this movie, mostly on Ajit's jackets, but Dharmendra has some too, including a head-to-toe plaid suit paired with Pucci-esque tie. Amjad Khan (as one of Ajit's gang) always appears in a ruffled tuxedo shirt and a giant plastic-y scar on the right side of his face. Often he wears a black jacket and tie, but for picking up a supply of drugs at the airport he chooses to wear a white jacket, red tie, and brown fedora. You know, keeping things low-key and inconspicuous. Asrani goes undercover as a hippie with lots of patches on his jacket and jeans; my favorite says ALL INDIA DRINKING TEAM. And Madhumati and Aruna get some nice dancing girl outfits; nothing too crazy, but how about this gold spangle-fronted top? Classy! Ajit just barely slips through Dharmendra's grasp in a car chase, relying on a helicopter for his escape. The car is full of loot, so he can't leave it behind and climb up to the helicopter on a rope; instead, the helicopter tosses down a net, he drives over it, and the car and driver are lifted into the sky. Dharmendra is most seriously displeased. There are a ton of "that guy"s rounding out the police force and smuggling crew. Does anyone know who this is? And some villain lair staples like a map room, that taxidermied tiger that is in every movie between 1966 and 1984, and a henchman in a polka-dot hat. Phew! There's so much more I could say about Charas—how it tidily opens and closes with destructive fires, how its action covers three continents, how nice it is to see Asrani with a role that is not simply comic or whiny—but your time is better spent just watching it for yourself. I love this movie in all its mid-70s streamlined masala glory! I remember Charas mostly for its wonderful music. I don't think I have seen it myself. As for the characters praying to Mary and Jesus. For many Indians it doesn't pose a problem to pray to gods of other religion. I know of Muslims, who visit Hindu temples regularly and of Hindus who visit churches and all visiting dargahs. They would vist any place of prayer as long as they have an assurance that their wishes will be fulfilled. Thanks, Beth, for a review almost as entertaining as the movie itself. I, too, love Charas. And I agree that it has a James Bond feel to it. 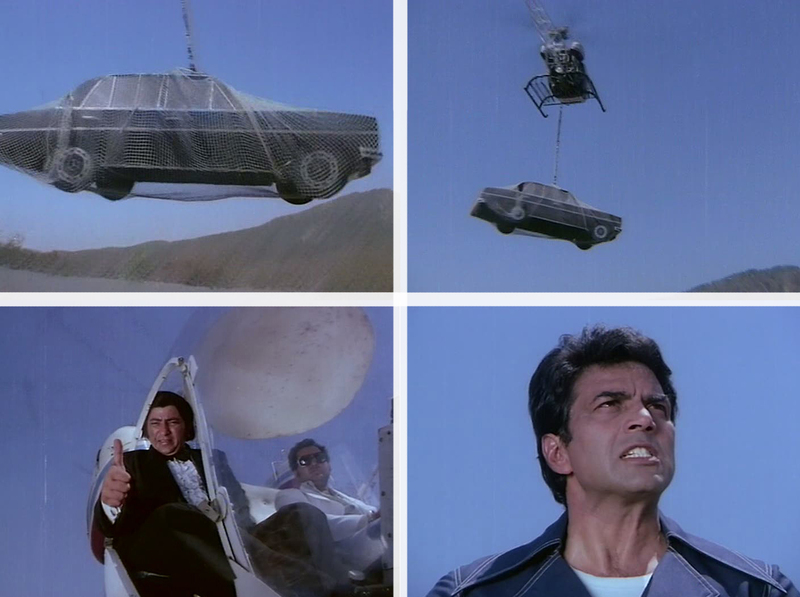 The scene of the helicopter airlifting the car is taken directly from one of the James Bond movies -- though Charas at least took the trouble to recreate the scene, rather than simply stealing the footage from the original film the way Jugnu did. I love 'Charas'. Now I want to watch it all over again. I remember watching the Egyptian themed song but can't say I have watched the movie. Looks interesting based on your review. I agree with harveypam about the praying to Mary and Jesus bit. Indians are generally fine with praying to deities of other religions. I hadn't even realized this was unusual until I moved out of India. My American friend was very surprised when I stopped to say a small prayer in a church we were visiting as tourists in Vienna. There is a statue of Mary in a Catholic hospital in the town I grew up in India. You will often find many non-Christians praying in front of it...they usually just pray to her the way they would to a Hindu goddess (Durga, Kali etc.). OMG I JUST FOUND THE AWESOMEST BLOG IN THE INTERNET!!!! "That guy" is Kuljeet, he is always excellently creepy in an insane kind of way. I love this film too, and my favorite song is the one Dharam and Hema sing in their hotel room---so, so sweet (and funny) :) Now you make me need to watch it again! Aaaaah sorry for my late replies to all of these! harveypam - Thank you! And thanks for the catch on Asit - all fixed now. As for the praying, I think what surprised me here is that it happens abroad AND that neither character has been showing praying previously in the film, so to me it felt like a sudden bit of religiosity that had a curious setting. I've certainly seen what you're describing in films but I think mostly those were Indian settings. Todd - Yeah this movie has "TODD" written all over it! I really wish I remembered the James Bond movies better - I've seen all of them at least once but they all blur together. I like your point about recreating the scenes - somehow it seems like a lot of work and thought went into this movie, doesn't it? batul - WATCH IT! DOOO IIIIIT! :D Or else Amrita and I will make you do so when we show up in Mumbai in March. zeeniebaby - That song is too fabulous! suyesh - HAHAHAH thank you!